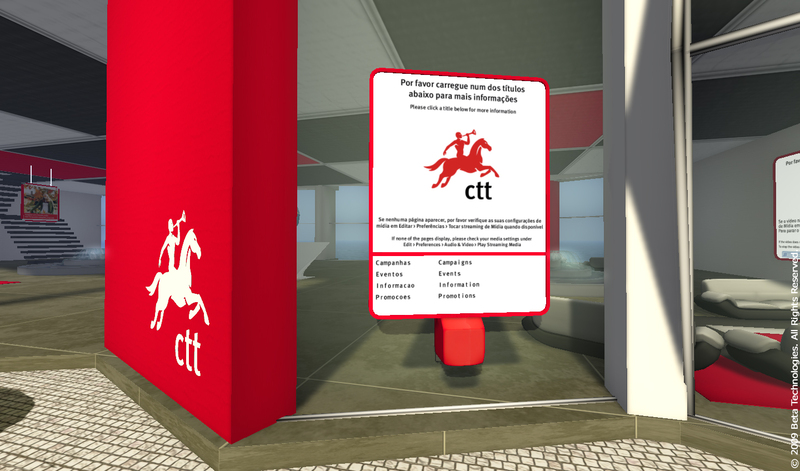 Home / News / Beta Technologies’ latest project opens today: CTT "World In Touch"
The Portuguese National Post Service, CTT — Correios de Portugal, have launched their virtual presence in Second Life® today. Their region, dubbed World in Touch, is CTT’s latest project using a vast variety of technological innovations in order to keep in touch with their clients. Developed by Beta Technologies, CTT’s virtual presence includes a virtual mobile phone from CTT’s daughter company, Phone-IX, a mobile operator in Portugal. The virtual mbile phone will allow two-way text messaging with users in Second Life and real life; it also includes some useful tools as “applets” installed on the virtual phone. The region “World In Touch” is bilingual (Portuguese and English) and will allow visitors to get a glimpse of CTT’s products and services, spread across six different areas — “The World of CTT”, “World of Philately”, “World of Ecology”, “World of Citizenship”, “Imagination World” and “World of Fun”. The visitors will land on a central spot, “The World Starts Here” where they are greeted by a message welcoming them, and from where they are able to move to any of the other spots.The “World of CTT” features a two-storey building with promotions of CTT products, information about CTT’s services, a visual calculator for parcel costs around the world, and the ability to get a Phone-IX Virtual Mobile Phone HUD. The “World of Citizenship” completes the information on several panels and will feature information and notices on CTT’s many events. This area will also be open to third-party entities wishing to promote in-world events about citizenship, social issues, or non-profit initiatives. The “World of Philately” is a building with two floors; on the ground floor, visitors can see and buy (in the real world) stamp collections or philatelic books (another collectable item). These can be browsed inside Second Life and the physical items delivered anywhere in the world — one of the first in-world eCommerce solutions for real items being sold inside Second Life, with L$, and delivered, free of charge, anywhere in the real word. The “World of Ecology” has two parts. One is a 3D representation of the only cork stamp in the world, which was issued by CTT in November 2007. This representation will allow visitors to “walk inside” the elements depicted on the original stamp. The other part is a labyrinth with a leisure area. The “World of Imagination” is designed to be a space for simulating, creating, and sharing concepts and innovative solutions, directly or indirectly related to stamps and the postal service, as well as do exhibitions and host contests. The last area is “World of Fun”, which features an auditorium and some meeting rooms. CTT/World in Touch also has a companion site, http://worldintouch.sl/. Second Life users can take snapshots inside Second Life and send them by email, using the built-in functions for that, to [email protected] This will allow SL snapshots to be embedded into a postcard or a stamp — a real stamp — which will be printed out and delivered to the users’ home. (Stamps will only be valid for Portugal). Beta Technologies provided most of the buildings, and all application development for this project, but the island is staffed independently. Official press release in Portuguese and English. World in Touch also has a Facebook page. Video above created by Halden Beaumont for CTT.